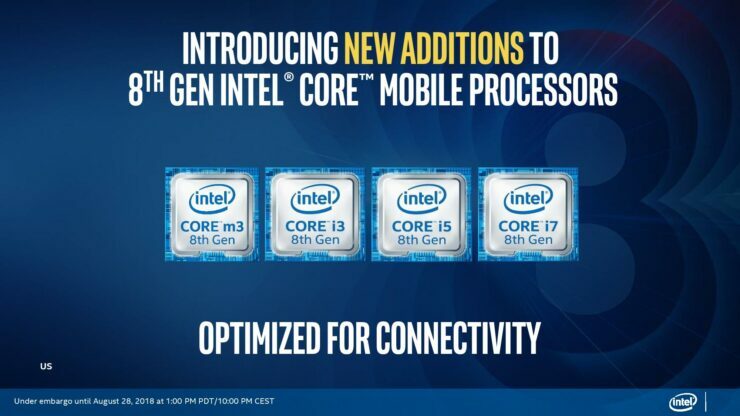 Intel has launched its brand new series of mobility processors under its 8th Generation branding. 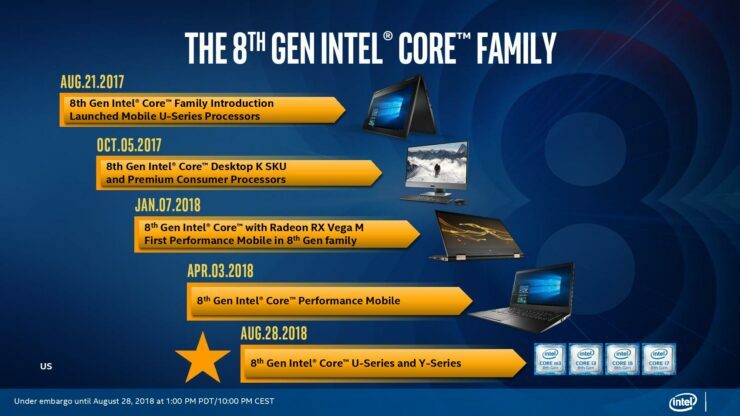 Codenamed Whiskey Lake, these new SKUs will provide multiple incremental upgrades over the former lineup – which was also called 8th generation. 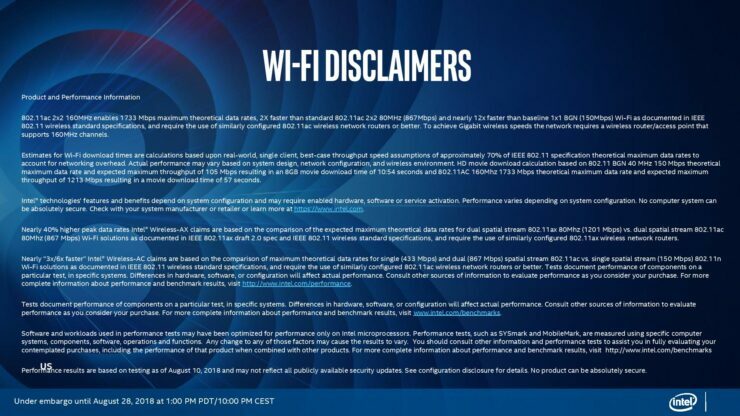 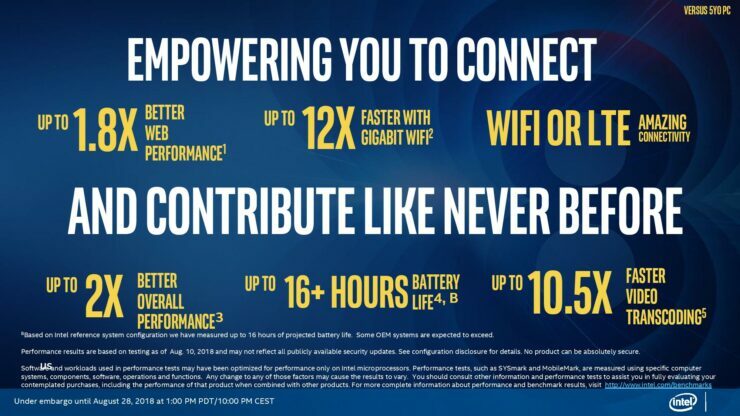 The company launched a total of 6 SKUs featuring Gigabit WiFi, improved clock speeds and more. 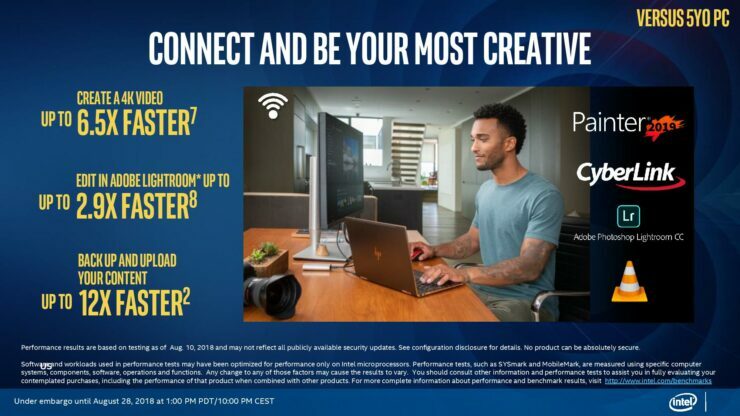 It’s worth noting that the primary indicator for Whiskey Lake when buying laptops is the newly designed “Optimized for connectivity” logo. 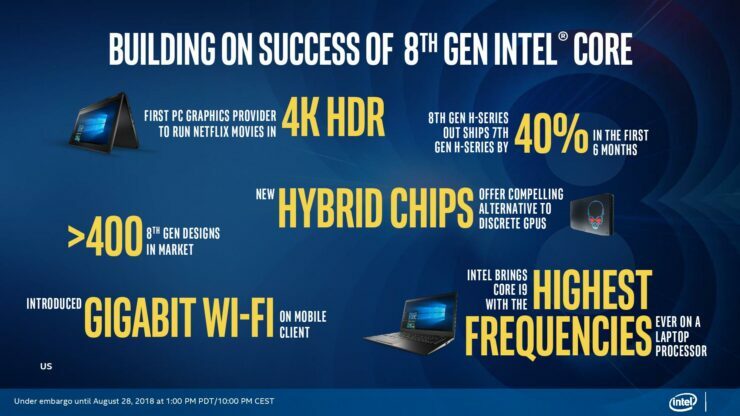 All the new Whiskey Lake-based 8th generation mobility processors are going to feature Gigabit WiFi as well as improved clock speeds thanks to better-binned die. 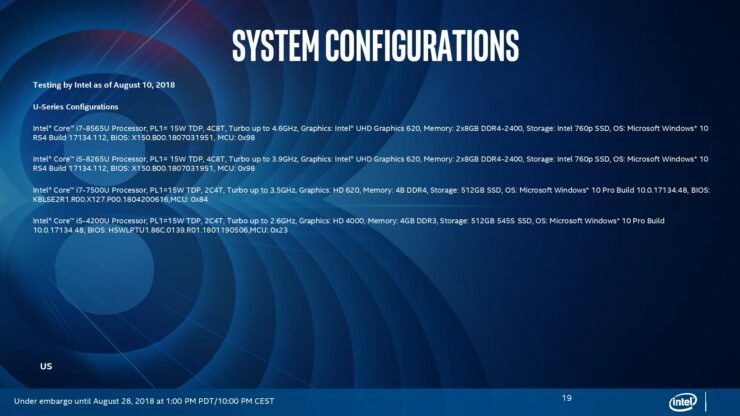 On the security side, the CPUs are going to have mitigations against side-channel attacks like Spectre and Meltdown but from what I heard – these are going to be software only since they are based on the exact same architecture as before. 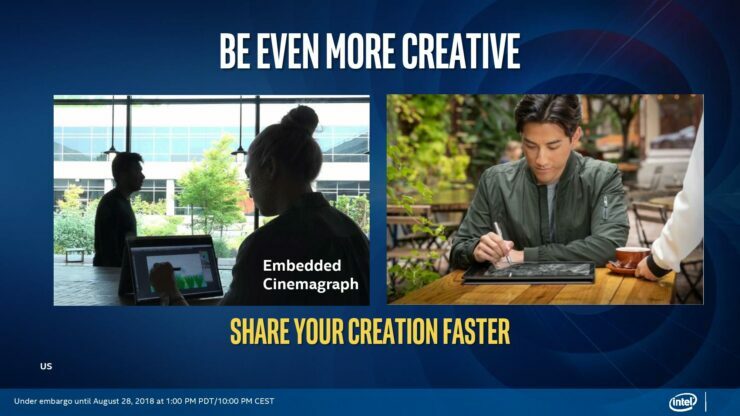 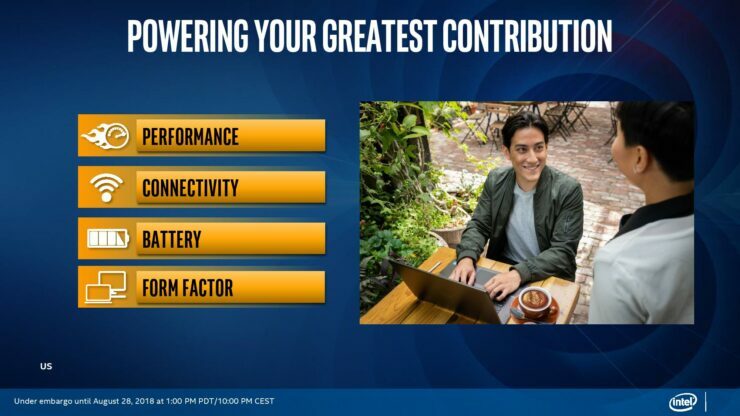 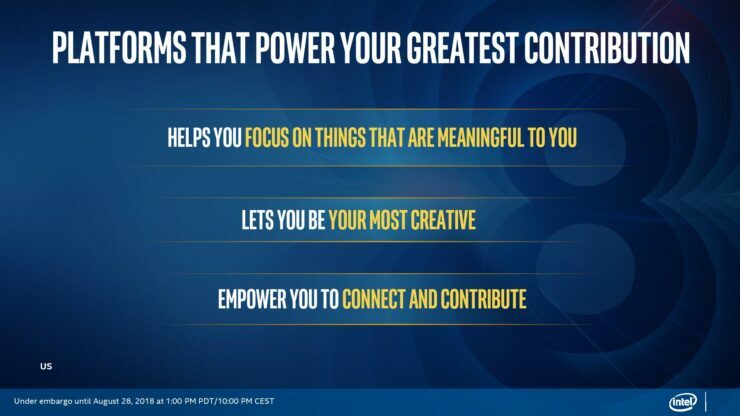 Intel is also boasting over 16 hours of battery life on optimized laptops (at 200 Nits) which should allow you to leave your charger at home without worrying about the device dying on you mid-day. 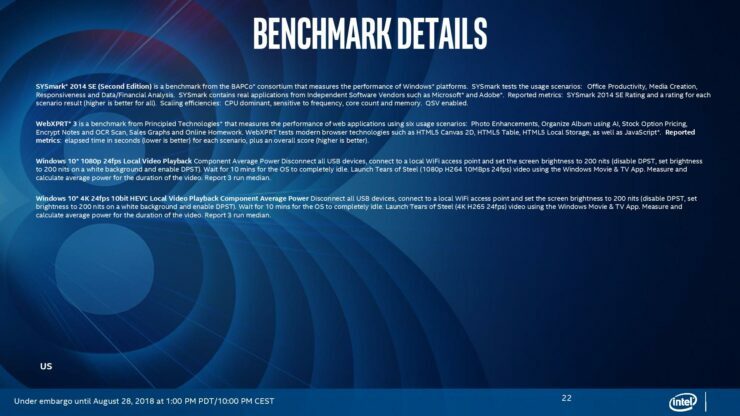 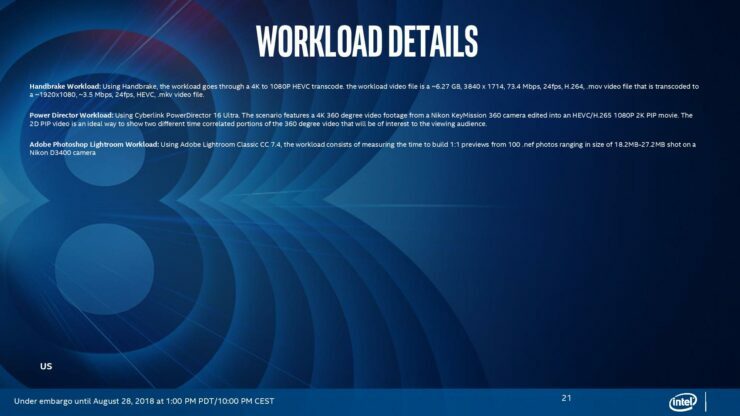 The fact that Intel has managed to cram 4 cores clocked at a jaw-dropping 4.6 GHz with 8 threads while remaining within the 15W TDP limit is nothing short of amazing. 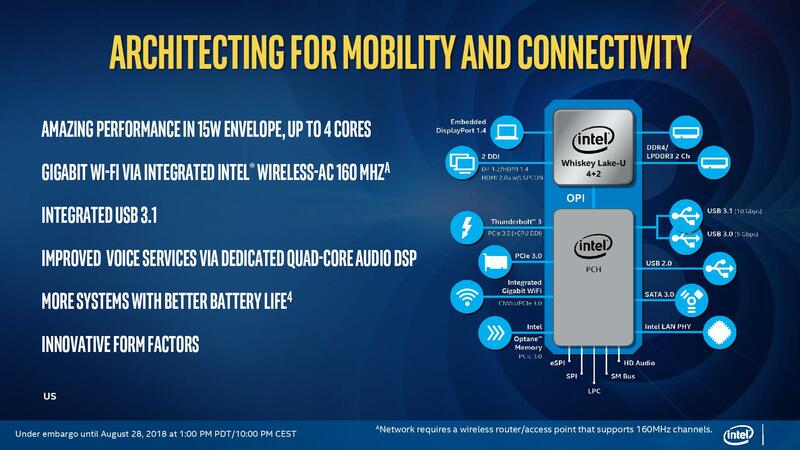 The i7-8565U is going to be nothing short of miraculous in the mobility segment and should allow the production of laptops that not only punch high on the performance side but also have headache free battery life. 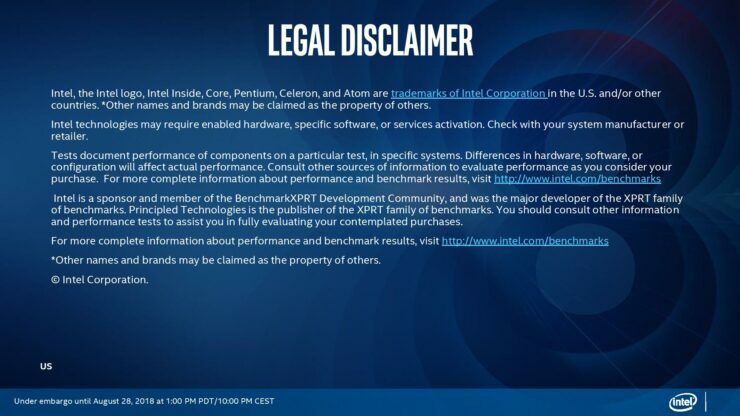 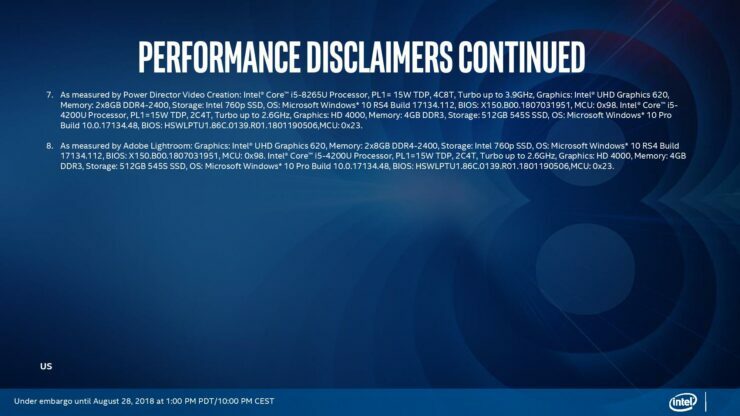 Intel is offering Hyper-Threading with all SKUs ranging from 2 cores to 4 cores. 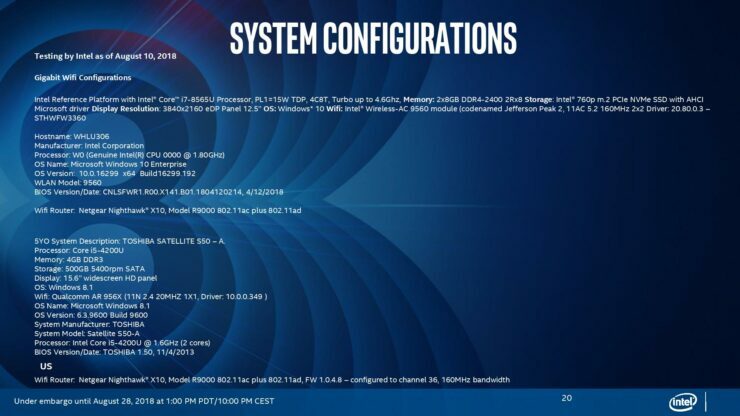 The U-Series consists of the Core i7-8565U, the i5-8265U and the i3-8145U. 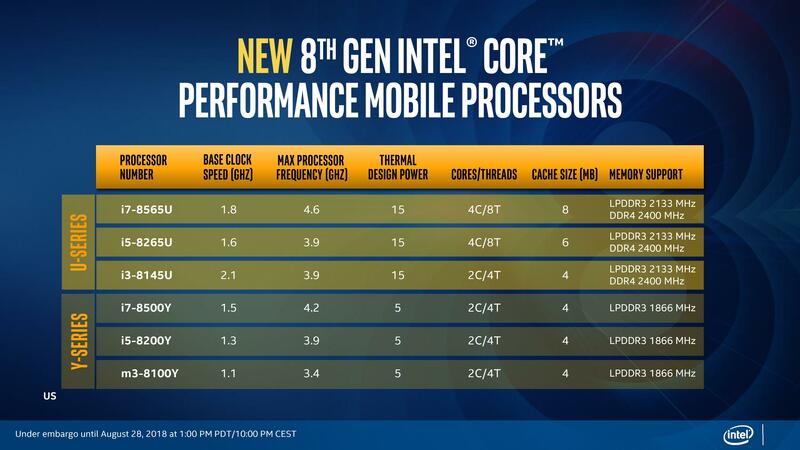 Hyper-Threading is present in all SKUs and only the i3 has the dual core design while both the i5 and the i7 have a 4-core design with the primary differentiator being the difference in clock speed. 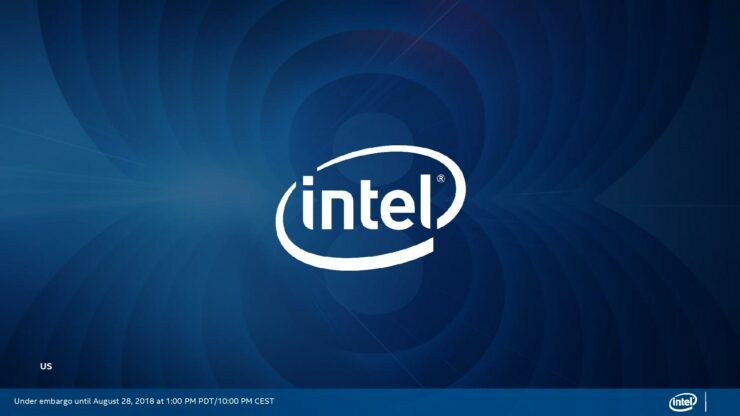 The Y-Series consists of the Core i7-8500Y, i5-8200Y and the m3-8100Y (the lowest end SKU). 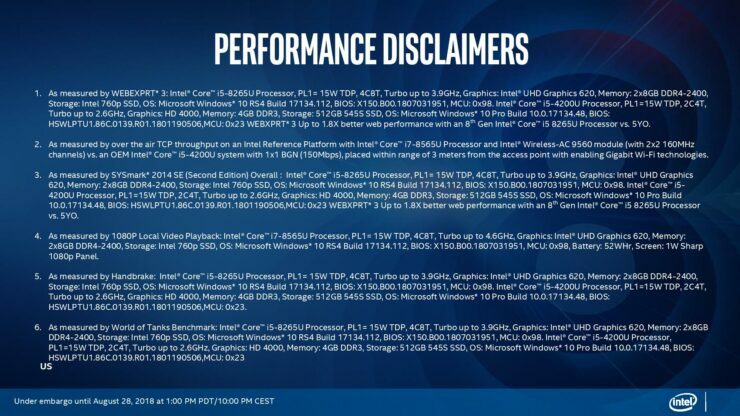 All of these parts are dual-core in design with 4 threads and only 5 Watt TDP. 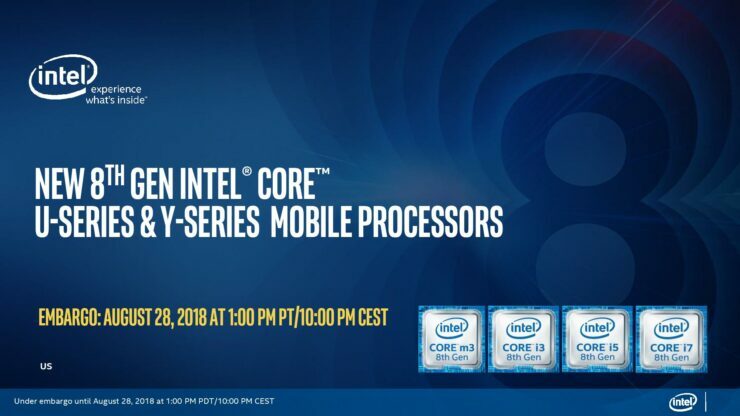 Intel today announced additions to the 8th Gen Intel® Core™ processor family, the U-series (formerly codenamed Whiskey Lake) and Y-series (formerly code-named Amber Lake) optimized for connectivity in thin, light laptops and 2 in 1s for the first time, while also providing ultimate mobile performance and long battery life. 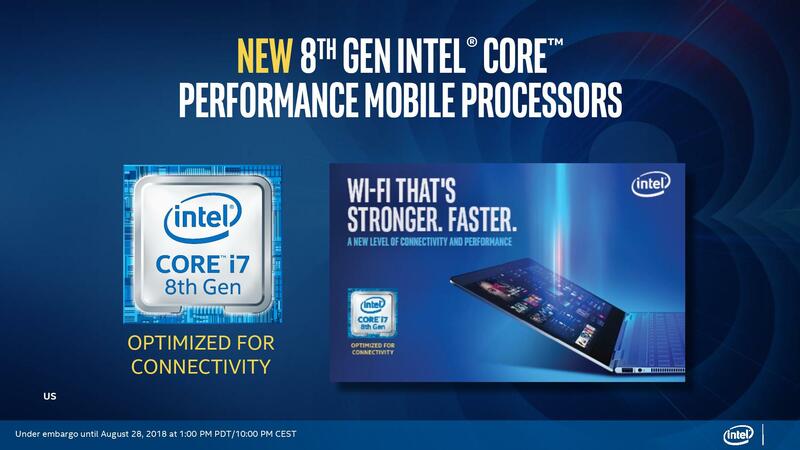 The latest 8th Gen Intel Core i7, i5 and i3 (U-series) processors deliver the ultimate performance in a 15watt envelope with up to four cores and eight threads for mainstream laptops and 2 in 1s. 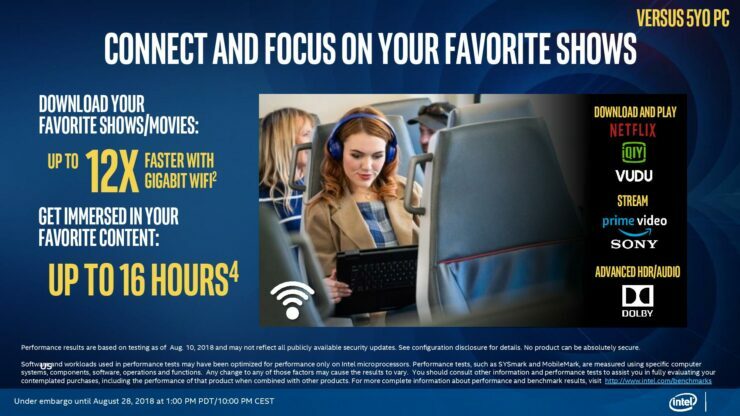 Devices with the new U-series processor can also support Dolby Vision™ HDR* and Dolby Atmos®* immersive audio. 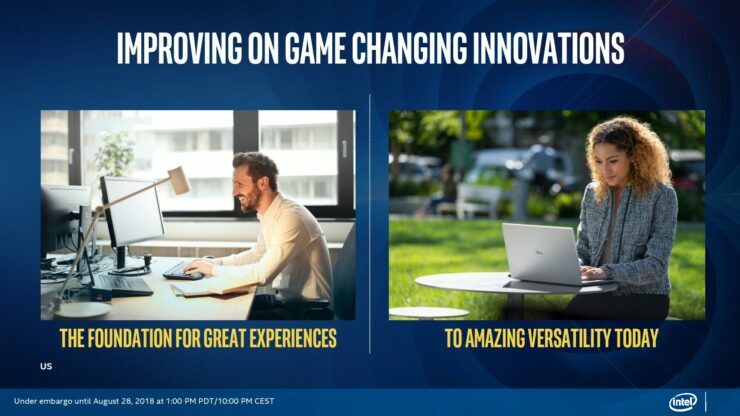 Together, the fusion of Dolby Vision and Dolby Atmos transform PCs into an entertainment powerhouse. 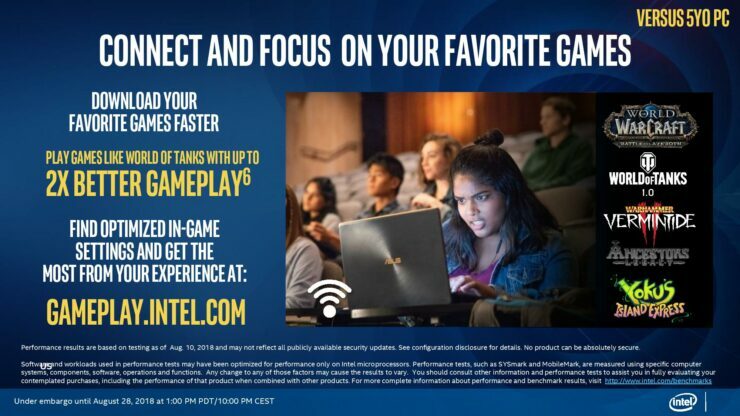 Play popular games on the go, including “World of Warcraft: Battle for Azeroth” and “World of Tanks.” Visit gameplay.intel.com for a full list of games and optimized settings for Intelpowered PCs. 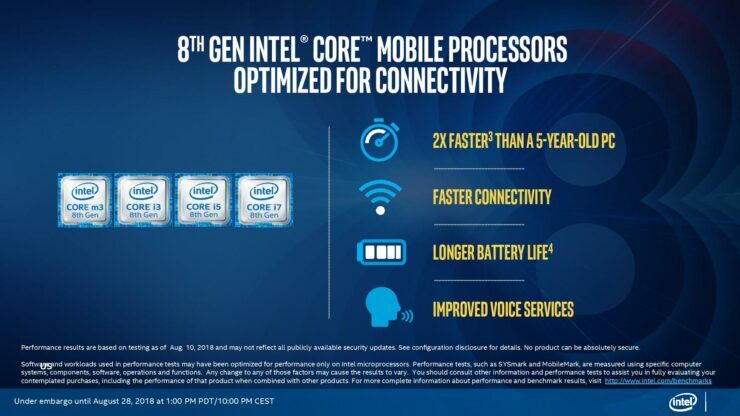 The first 8th Gen Intel Core i7, i5 and m3 (Y-series) processors are balanced for mobility and deliver incredible performance that people expect from Intel processors in super thin-and-light devices with fast Wi-Fi and LTE connectivity. 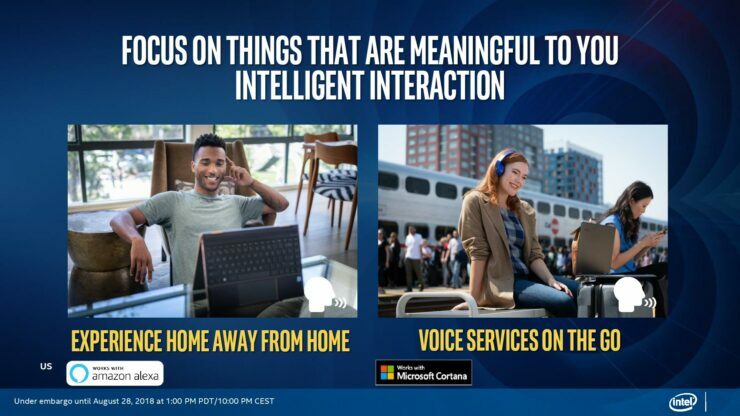 Stream, share or download with Intel Wireless-AC supporting Gigabit wireless speeds, and experience seamless and reliable connectivity with Modern Standby and eSIM support with Intel’s Gigabit LTE modems.